The present case has been reported in the BMC of Infectious Disease Journal. A 51 year-old male veteran presented with progressive lethargy, fevers and constant frontotemporal headache for past 3 weeks as well as 20 pound weight loss in past 6 months. His medical history was notable for polycythemia vera (PCV) treated with ruxolitinib for 18 months. On admission the patient was febrile to 103.5 °F, tachycardic, and O2 saturation 95% on 2 l of oxygen by nasal cannula. Physical exam revealed somnolence, diminished breath sounds at the left lung base and diffuse abdominal tenderness. Neurologic exam identified no focal deficits. Initial laboratory studies (normal range) revealed hyponatremia to 125 (136–145) mmol/L and a creatinine elevation to 1.8 (0.67–1.17) mg/dL. He also had an elevated alkaline phosphatase of 208 (35–140) U/L and total bilirubin of 1.6 (&lt; 1.2) mg/dL. White cell count was 8002 (4000-10,000) cells/mm3 with 74% polymorphonuclear cells and 13% lymphocytes. The C-reactive protein level was 3.89 (&lt; 0.5) mg/dL and the erythrocyte sedimentation rate was 36 (&lt; 30) mm/hr. Rapid HIV antibody testing, as well as HIV viral load, were negative. The brain MRI revealed innumerable rim enhancing lesions at the gray-white junction consistent with pyogenic abscesses secondary to hematogenous infection. A lumbar puncture revealed 10 mononuclear cells and 9 polymorphonuclear cells/ml CSF. Glucose was 27 (40–70) mg/dL and protein was 72 (15–45) mg/dL. Vancomycin, ceftriaxone and metronidazole were initiated empirically. The patient subsequently underwent chest and abdominal CT examinations to evaluate diminished breath sounds and abdominal tenderness. A retrocardiac mass was seen measuring 2.7 cm as well as bilaterally enlarged adrenal glands consistent with infiltrative infection or neoplasm. 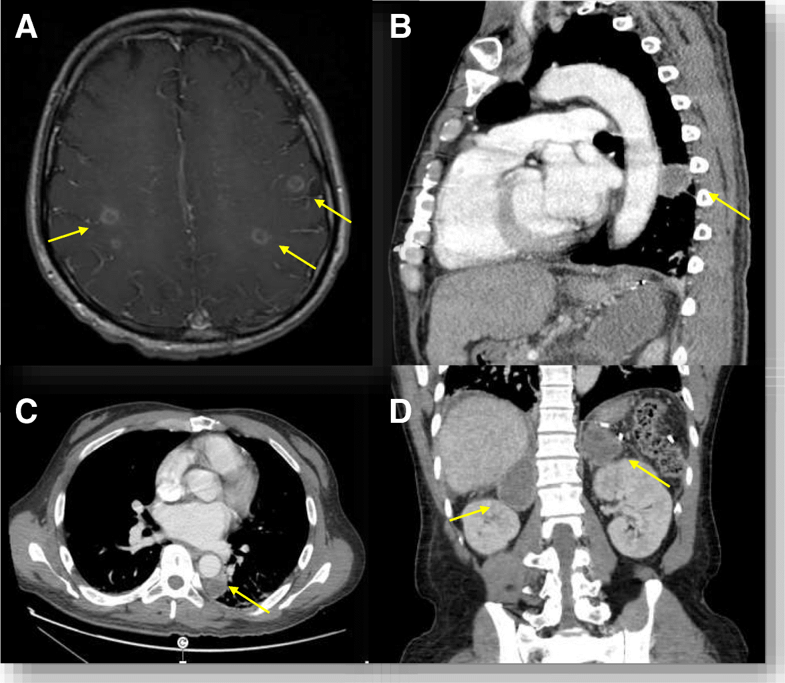 The patient was diagnosed with concurrent cryptococcal meningitis as well as disseminated histoplasmosis.